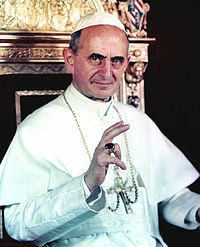 Never to be accused of being an old romantic at hear, Pope Paul VI issued on this day in 1969 the Mysterii Pascchalis, reforming the liturgical year and revising the calendar of the saints. This motu proprio (from the Latin, at one’s own accord) represents an official decree not prompted by another or in response to current developments or findings yet still has the force of law regardless of motivation, among other things struck many figures from the Calendarium Romanum, the cycle of celebrations called the Proper of Saints—to include Saint Valentine, whose feast day coincided with the decree. Only wanting to preserve the rites that were truly of universal importance to the faith, the Pope deleted or transposed nearly fifty solemnities for all our favourites, mostly due to redundancy or their problematic histories, including the saintly family of Maris, Martha, Abachum and Audifax, Canute of Denmark, Dorothy of Caesarea, Faustinus and Jovita, Ursula and her companions, Simeon, the Seven Sleepers and Saint Barbara.